What constitutes a flawed typeface? For this article it is deﬁned as a typeface that is perfectly ﬁne—except for one nagging aspect, usually a single character. A flawed typeface is one that either you avoid using entirely because of this lone defect; or one that you use sparingly—and only then, after some alteration of either your design or the face itself to ameliorate the “flaw”. Flawed typefaces are not bad or even mediocre. The whole premise here is that they are good, perhaps even classic or wildly popular. And yet there is a single character that “ruins” them or, at the very least, causes one to pause before specing them. This article attempts to explain the flaws in 23 fonts: what they are, why they matter, and what to do about them. Disclaimer: these are opinions, not facts. Ultimately, flaws are in the eye of the beholder. 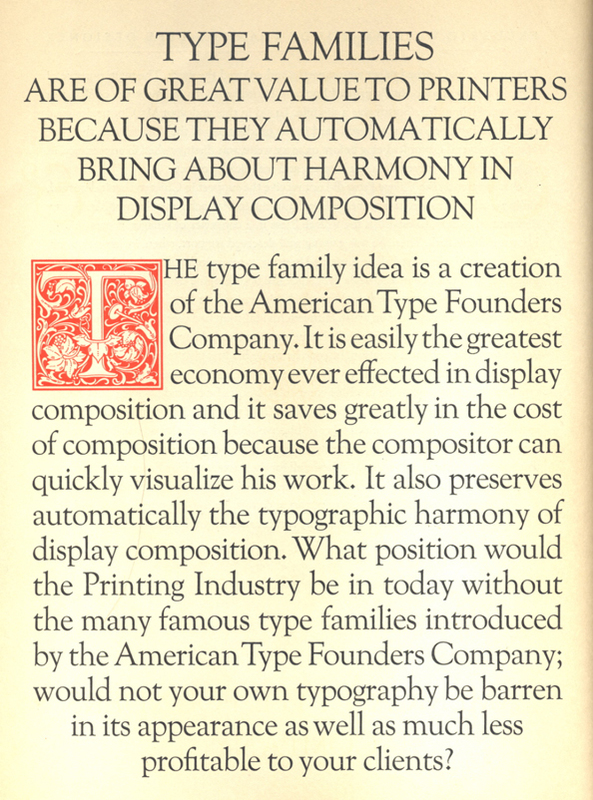 American Type Founders altered Frederic W. Goudy’s design to ﬁt its common line, a measurement instituted to insure that all of its typefaces could be aligned with each other. Most of the descenders survived the abuse, but not the g. In the digital world there is no reason why Goudy Oldstyle cannot be restored to its proper look. Goudy Oldstyle compared to Adobe Garamond Pro. Goudy Oldstyle detail from 1923 ATF type specimen. Lanston Type Company, a subsidiary of P22, has done just that with alternate long descenders available as part of its LTC Goudy Oldstyle Family Pro. The hot metal version of Bembo came with two versions of R, one with a short leg intended for text composition and the other with an elegantly extended leg intended for titling purposes. Unfortunately, in the phototype era the second R was the only one available and that situation continued with the PostScript version of Bembo. Both Rs are once again available with Bembo Book Pro. Unfortunately, the long-legged R remains the default character. Detail of De Aetna typeface by Francesco Griffo (1495). The model for Bembo. Top line: Bembo, Bembo Book MT Pro and Bembo Book MT Pro with alternate R; Bottom line: FF Quadraat and FF Quadraat (kerned). FF Quadraat is another font with a problematic R. Its leg sticks out a bit less than Bembo’s but it also dips noticeably below the baseline. It spaces poorly and creates a visible tic in a block of text. The R in Centaur also has a leg that juts out, but the flawed letter is the odd j with its dirk-like wiggle. This letter is a Bruce Rogers invention since Nicolas Jenson did not have a j in his typeface. Presumably, the wiggle was added to keep the j from having to be kerned. It is distracting in text, beguiling in headings and logos (see john varvatos). Centaur MT Std compared to Adobe Garamond Pro (both kerned). DTL Dorian, a font that I recently included in my column on underappreciated fonts, is afflicted with a bothersome S and s. The top curve ends in a bracketed serif while the bottom curves simply curls up, giving both letters a top-heavy look. They don’t ﬁt in easily with other round letters, either. DTL Dorian T compared to Adobe Garamond Pro (both kerned). Didot the Elder is full of weird—yet historically accurate—characters: C, G, S and s with arrow serifs; f with a “serif” on its crossbar; y with a bent descender; and g with a seriffed open loop. Most of these are fun. But the g is annoying in a lengthy text. Unfortunately, there is no normal alternate available. Optimo Didot the Elder compared to Linotype Didot. Detail of page from 1819 type specimen by Pierre Didot; type cut by Vibert. Sabon, one of the most beloved typefaces of the 20th century, was originally designed for three technologies: foundry, Linotype and Monotype. When it was adapted to ﬁlm and subesequently to digital it was the Linotype design that was carried forward. This meant that the italic was compromised since the linotype version was duplexed. Thus the italic is wider than normal. This dismays many people, but it might be acceptable if it were not for the nearly round o. The solution is to use Sabon Next Italic instead. However, Sabon Next is not beloved by fans of Sabon. Not only did Porchez go back to the foundry version of Sabon, but he went beyond it to the typefaces of Garamond and Le Bé which Tschichold was using as models. And then he went even further and added alternate characters (some reprising those of the original Sabon, others more fanciful), swash characters and quaint ligatures. To many, the result is a typeface that seems more Adobe Garamond than Sabon. But, on its own terms Sabon Next is a ﬁne face—except for the alternate q. This is a capital form (common in Renaissance calligraphy) that looks totally out of place, especially with its too short tail that looks shriveled up from embarrassment. But it’s an alternate character and can be easily ignored. Since writing this it has been pointed out by Jean-François Porchez that there is no alternate q. Instead the letter is a small cap Q. I was misled by the label in the glyph palette which says “small letter q”. But glyph palette labels are often incorrect and I should have checked with Porchez ﬁrst. As admired as ITC Galliard has been from the outset, its aggressive italic has not always found favor, especially the pelican-jawed g. Anticipating this, Matthew Carter designed an alternate g for such people, but when the International Typeface Corporation took the font over from Mergenthaler Linotype, it was set aside, along with other additional characters. These characters were all returned to the font when Carter re-released Galliard (the regular weight only) through Carter & Cone Type. I am not one of those who disliked the pelican-jawed g, but I am happy to have the alternate g as well. Neither Latin nor Italian use y as a letter. Thus, it does not have deep historical roots. In cursive writing it often takes two forms, one derived from v and the other from u (letters that were interchangeable in Ancient Rome). Italic typefaces frequently follow the v form, often to the detriment of the rhythm of the letters and thus to consistency of spacing. Perhaps the most egregious example of this is Weiss Antiqua Italic (originally Weiss Kursiv), one of the ﬁrst typefaces to follow the chancery model. The y has a beautiful, sweeping left arm which makes proper spacing difﬁcult and, in the case of ry or ty, nigh impossible. Top line: Weiss Italic (tracked) and Weiss Italic (tracked and kerned); Bottom line: Cataneo Light Italic for comparison (kerned). In both kurrentschrift and English roundhand the w is often made in the form of an n joined to a u. This form is usually dropped from modern typefaces—compare Matthew Carter’s Snell Roundhand to the sample alphabet by Charles Snell—but an exception is Comenius Italic by Hermann Zapf. Although Zapf has redesigned the character at least once since the typeface’s debut, the w still looks peculiar to modern eyes. Comenius Italic (kerned) compared to Palatino Italic. Roundhand alphabet by Charles Snell from The Standard-Rules of the Round-Hand and Round-Text Hands (1714). Franklin Gothic is one of the most iconic of American typefaces. It is an unusual design in that it is heavy and there was never a regular version from ATF. Instead, ATF made condensed and wide versions and then lumped Franklin Gothic with several other Morris Fuller Benton-designed gothics (Lightline Gothic, News Gothic, Monotone Gothic and Alternate Gothic) as a de facto family. This satisﬁed printers and designers for decades. But when ITC licensed the face they decided to not only adapt it for photocomposition but to make a proper family. Thus, we have the anomaly of ITC Franklin Gothic Book. The updating of Franklin Gothic involved a number of small annoying adjustments that chipped away at its identity, most of which can be accepted as the price paid for having a harmonious family. The one change that went too far was the mucking about with the distinctive Franklin Gothic g. In ITC Franklin Gothic it looks like a mailbox flag. This completely changes the appearance of a block of text as the ear on the g keeps popping up like a schoolchild overly eager to answer a question. Luc(as) de Groot’s Thesis is perhaps the largest type family ever created (144 fonts at last count). Despite its widespread popularity it has one character that makes it unsuitable for certain usages, such as information design: the Q. It has a detached tail which, at best, is a distraction and, at worst, makes the letter look like an O with an accent. This is especially true at small sizes. Revising a classic typeface is a dangerous thing, even when there is widespread agreement that the existing version needs a sprucing up. It is even more traumatic to type users when no one but when the original designer thinks that a total overhaul is required. One such instance is Syntax which Hans Eduard Meier, its designer, refashioned from scratch in 1997 as Linotype Syntax. Rather than just ﬁx the poor digitization of the original Meier took the opportunity to return to his original 1955 vision of what the face should be. The result is a design that is more calligraphic than typographic—nice, but flawed. Two of Syntax’s hallmark letters have been ruined rather than improved. In Linotype Syntax the splayed M is splayed even more than before and the R now has an open bowl. Syntax compared to Linotype Syntax. Sometimes a flaw in a typeface is a very tiny thing. With the new Carter Sans the square dots on the i and j appear too large. Matthew Carter may have done this deliberately to make them hold up at small text sizes. But at display sizes they jump out. Carter Sans Regular compared to Optima Nova Medium. The PostScript version of Bickham Script had a significant flaw: the T, the second most common letter in the English language. It is designed with a very wide base that makes it ambiguous. Is it an T? an I? or even a Z? Instead of being corrected in the OpenType version, this problem has been exacerbated. There are no simpler alternate forms, only two fancier Ts, both of which have similar ambiguity. The designer of the logo for The Astor, an apartment building on the Upper West Side of Manhattan, took matters into his own (or her own) hands and simply lopped off the base of the T, among other indignities. It would be better to have a trained type surgeon like Lipton do this. Top line: Bickham Script with regular T and contextual Th; Bickham Script with medium T and different h; Bickham Script with large T and different h; Novia Script. Bottom line: Bickham Script with contextual swash Th; Adobe Caslon Pro with contextual Th; Big Caslon. This digression was occasioned by the appearance of the automatic Th ligature in Bickham Script Pro when setting samples for this article. This is a contextual ligature, one that is word-dependent. It is on by default but can be turned off. Adobe has pioneered the Th ligature and the ﬁrst time that I encountered it I was thrilled. It is exactly what I have always done as a calligrapher to solve the horrible gap created by h following T—one of the most common occurrences in the English language. But, when I began to see it in non-calligraphic fonts such as Adobe Caslon I found it distracting. We have become so inured to that large space that we no longer notice it, especially given that we read in chunks and the most common Th words (The, This, That, There, These, etc.) are thus gobbled up easily. Ultimately, a ligature is intended to improve spacing so that the reading experience is not disrupted. A ligature that makes us stop and take notice is not doing its job. Maybe the Th ligature will become second nature, but for now I am having second thoughts about its value. 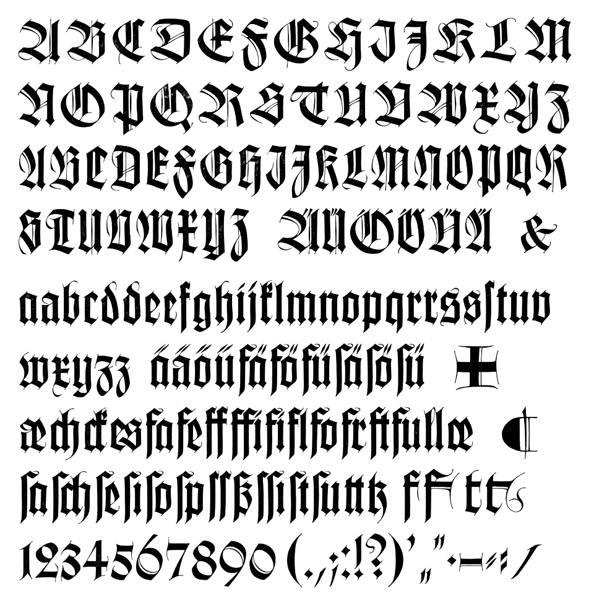 Burgundica is a modernized fraktur. As such, it has several letters that are inherently problematic for modern readers, especially non-German ones. The A, D and S are all extremely difficult to recognize in frakturs. For Burgundica, Gerrit Noordzij simplified each of them, but not enough. Which one is the fatal flaw depends on the reader. For those who want to still use Burgundica, the solution is to ﬁnd a compatible roman face—ideally from a Noordzij font—and substitute its capitals. Top line: Burgundica X025. Bottom line: Burgundica X025 with 84 pt Milo Serif Medium S in second example (kerned). Unfortunately, Noordzij has only made his Ruse font available and it does not ﬁt well with Burgundica. The font that does is Tret. Noordzij says of it, “Tret was drawn with the essential properties of fraktur in mind.” Sudum is calligraphic enough that it might work as well. Texturas are not as difﬁcult to use as frakturs for non-German speakers, but they still pose problems. Roman lowercase letters with diagonals in them either stick out or are adapted so well that they are not easily identiﬁable. The digital version of Wilhelm-Klingsporschrift (now called Wilhelm Klingspor Gotisch) by Linotype was modernized to make Rudolf Koch’s masterpiece more palatable to modern designers. The k is excellent but the x is awful. Vertical rhythmn is essential in a textura and the x is a stumbling block. And, for some reason, Linotype ignored the unfamiliar A. For those used to blackletter, the x is the flaw in Wilhelm Klingspor Gotisch; for those not used to blackletter, it is the A. Top line: Wilhelm Klingspor Gotisch. Bottom line: Flamande for comparison. Complete character set of Wilhelm Klingsporschrift (Rudolf Koch, Klingspor, 1926). Metal setting courtesy of Michael Babcock, Interrobang. Sometimes the character flaw in a typeface is less obvious. Instead of a letter, it is a figure or a punctuation mark. Univers purists like Helmut Schmid and Willi Kunz insist on Berthold BQ Univers among digital options. They disdain other cuts for being poorly digitized, for having italics with the wrong slope, and for not having the correct ampersand. However, the proper ampersand—a true et ligature—looks odd to those without paleographic or calligraphic training. So, which is the flaw? Figures are often overlooked in discussions of a font’s attributes, but for anyone working in the area of information design or signage they are crucial. The most important ﬁgure of all is the 1 because it is the most common. Unfortunately, it is the figure that causes the most trouble. It can be confused with capital I and lowercase l in sans serif typefaces, and in all typefaces its inherent narrow width forces designers to make compromises either in its form or its set width. Eric Gill designed the 1 in Gill Sans without a flag, thus making it virtually indistinguishable from I or l. Monotype resolved this disaster in the days of machine composition with an alternate flagged 1. But it was not included in the digital version of Gill Sans. One solution to this problem has always been to substitute a 1 from another sans serif face. However, this is no longer necessary as the flagged 1 is part of Gill Sans Pro. Top line: Gill Sans and Gill Sans kerned with 70 pt Futura Book 1. Bottom line: Gill Sans Pro with alternate 1 and Gill Sans Pro with alternate 1 kerned. The narrowness of 1 has forced designers to add unwanted space on either side so that it will set properly in tabular matter. This makes for loose text setting. This problem is exacerbated with sans serif faces. One solution has been to add serifs (often oversize ones) to the base of the ﬁgure, creating a character that is out of character with the rest of the font. News Gothic is one such example. In a string of numbers the problem is unnoticeable since most ﬁgures do not have serifs in a serif font. But when set next to letters a seriffed 1 in a sans serif typeface jumps out like a sore thumb. One solution is to cut off the serif in Adobe Illustrator or FontLab and then kern it. Another is to use a more compatible 1 from another font—or an entirely different set of ﬁgures entirely. Top line: News Gothic. Bottom line: News Gothic kerned with baseline shift (for the hyphen). Finally, the lowly punctuation mark may be the irritant in a typeface. The exclamation point and the question mark are the most obvious of these since they are the largest. Monotype Bulmer has a chubby exclamation point, resembling an exploding cigar, that is at odds with the elegance of the rest of the typeface. It belongs in a Betty Boop cartoon. On the other hand, Weiss Antiqua has an exclamation point that is so short that it looks to be in danger of vanishing entirely. It is not a bang but a whimper. Bulmer MT; Weiss Medium (tracked); and Century Schoolbook (tracked) for comparison. To make the question mark in Weiss Antiqua equally short E.R. Weiss cut off the bottom portion where the character either shifts from a curve to a vertical line or simply curls up. Even stranger is the question mark for Schneidler Medieval. It appears to be upside down. For those who like the typeface, the question mark is its flaw. But for those who dislike Schneidler Medieval—and there are reasons, ranging from its overtly cupped serifs to its capital O—the weird question mark is no big deal. Top line: Weiss Medium and Schneidler Medieval (tracked). Bottom line: FF Milo Serif for comparison; Schneidler Medieval (tracked and kerned). In the end, some flaws are only blemishes to those who deeply love a typeface. But other flaws are more serious as they hinder legibility, inhibit reading, or fail to perform their expected function. Whether the flaws in a given typeface are fatal or can be worked around depends not only on the typeface but on the typographer. Caveat littera!